Ok peeps, it's time. After minutes of design calculations and 2 prototypes, it's done and good enough to release. Guys, you are going to be dumbfounded at how good this thing is. I do not mean "good for a speaker in a bucket", I mean good compared to very expensive commercial offerings. It is as good as my Cube, maybe better. No, not maybe, it is and it pains me to admit it. No, it does not look as good and it is not small and easily hidden but it makes up for all that in performance and the fact it costs practically nothing and anyone can build it easily. 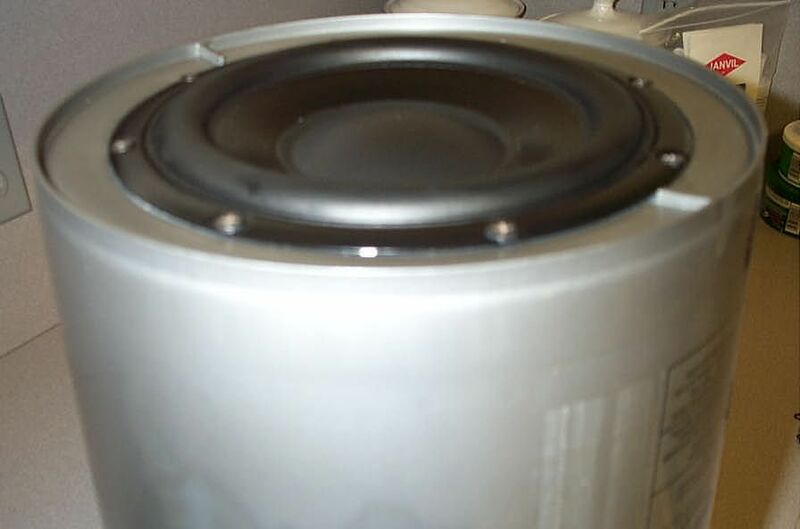 2. a subwoofer amp or one that can be used like one, I prefer the Crown XLS series...any of them. They only have low level inputs so you should make a cable to convert from speaker level to low level.....a 600 ohm resistor in line with the center pin on an RCA is perfect for the Crown amps. The other end should be connected to the main amp along with the speaker wires. The main amp will not notice the 600 ohm load. I use a 1/2 watt 600 ohm resistor, an RCA plug and 18gauge speaker wire to make the cable. The Crown amp is very nice and the xover is fantastic, the power of them is insane. I run 2 subs in parallel and the amp in bridged mono. I don't care for "stereo subs" but the Crown will do that as well. 8. one bag of fast setting concrete. 10. maybe some small sheet metal or wood screws for the driver.....I did not screw it down on mine but it would not hurt. Pay attention here as this is extremely difficult and painstakingly hard to do. Not. 1. turn bucket upside down and use driver to determine the size mounting hole. 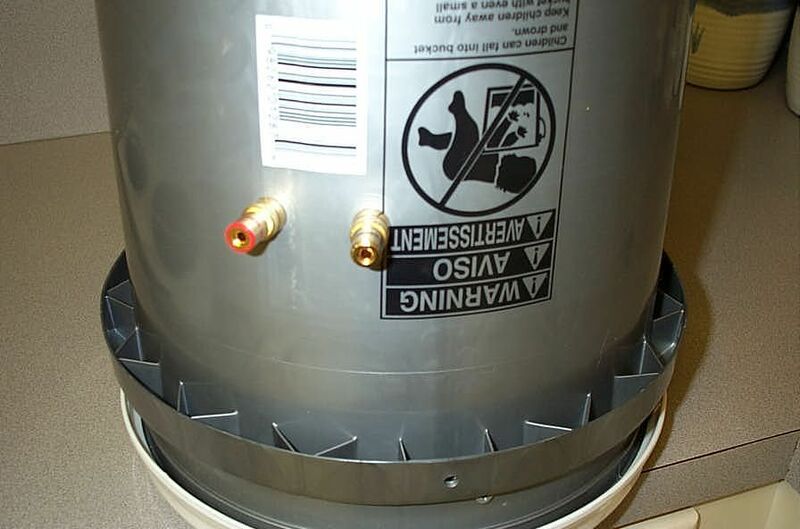 Cut hole in bottom of bucket. Test the fit. Get another bucket if you screw it up. 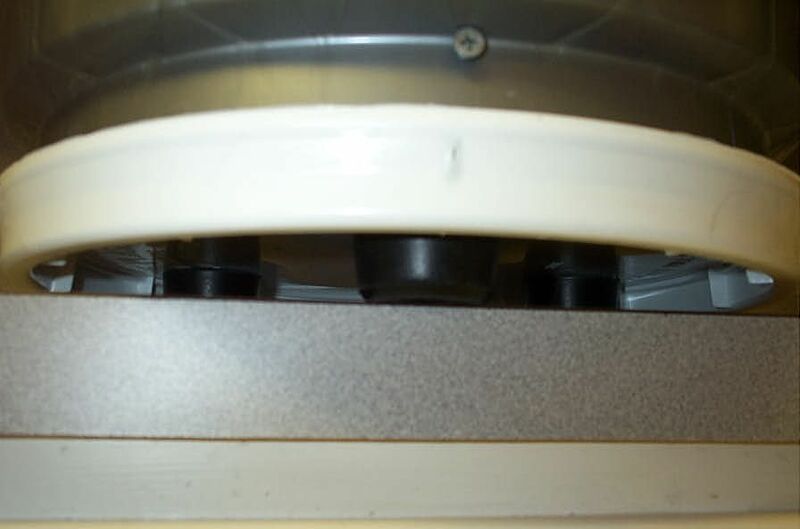 3. between the lid and the the projection on the bucket drive the 3 inch deck screws in. They are the anchors for the cement. I used 4, use as many as you like. 4. drill a small hole above the projection on the bucket for the wire to exit. 5. mix the concrete in another container....we don't want it on the inside walls, be neat here! Mix it thoroughly and not too runny! 6. with bucket upside down, carefully pour/scoop cement through the driver hole and fill it just above the projection on the bucket making sure it covers the anchor screws. 7. Let it dry at least 24 hours, although it will be hard in an hour, don't be tempted 2 days is even better, probably The concrete must be COMPLETELY DRY, not just hard!Almost done! I will be happy to supply the driver, amp, feet and screws to anyone that would like to just have a "kit" rather than hunt the stuff down. The "kit" will have everything except the bucket and concrete. No price yet but I guess 250 bucks including shipping should do it. Of course any plate amp you might have will/should be fine.....no substitutions on the driver!!!! Please pass this thread around! This thing is too good to be suppressed! 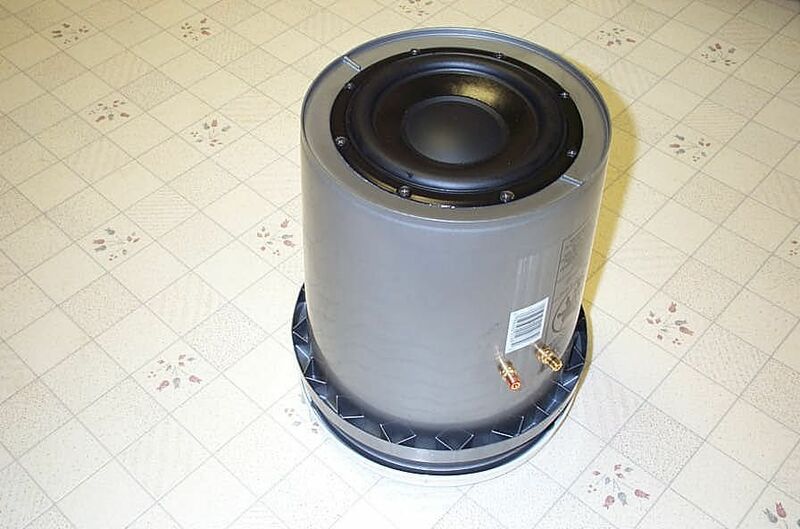 The F'n Fantastic Redneck Subwoofer Mark 4:20 i. (King James or Cheech and Chong,either is good) is not a joke! Could you run it in a car trunk, Ed? It's way too good for that! Make no mistake, the only joke here is the name. Car boomers are cheap anyway. It would make a nice car boomer for sure. I heard it again today with the concrete and little tweaks. I enjoyed it a lot. Ed's F5 clone, the Naked Truth and the FFRSMark 4:20 provided some seriously dynamic, detailed and clean sounding tunes. Some folks may say the system was down right moozical. The F5 is actually growing on me and has nary a toob in it. It images very well having a wide stage and depth. I like its tonal balance with the Heiled Horns and sub. I really do think it has improved over the past several weeks, so maybe its parts are happier and more well-adjusted now. sonic should like that one... There's no wonder the diy people are being manic about it. Some passages of "Dark Side of the Moon" were absolutely startling; I don't remember the Horns sounding any more dynamic than they were today. At times, they reminded me of the Model 3 stacks like homey rocks. Carole King's mediocre recordings had new life and her voice had improved dimension and more layers than what I recall. It all sounded very sharp and clean, but possessing finesse and being more forgiving in the highs than other solid state amps I've heard. The sub, the F5 and the Naked Truth had synergy and sounded right. I was surprised the sub sounded so authoritative with my modest little TBI sub amp (200 watts). A subwoofer amp with more power and authority would be fun I'm sure, but a luxury. As it is, there is more output than necessary for a mouth-breathing, lease-breaking fool to be content. 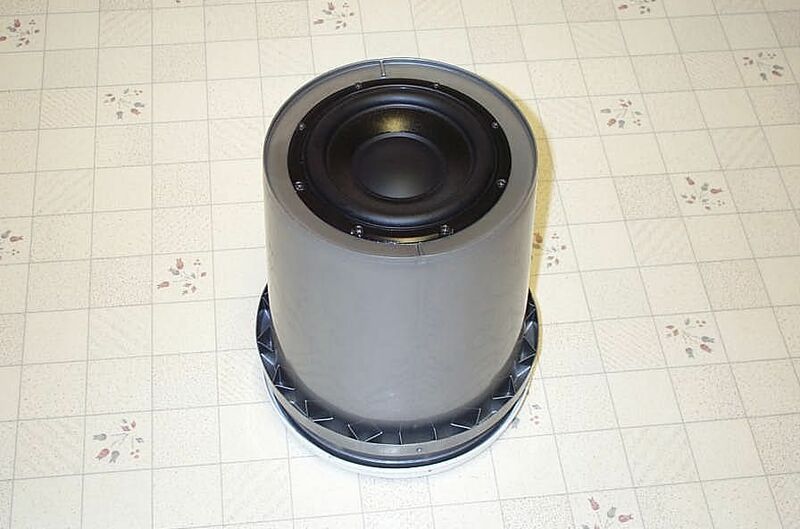 If you want inexpensive, high quality bass, the Peerless sub in a bucket works. Just a few questions for you guys before I start this project. I already own 2 subs. One is a SVS-PB12NSD. It is huge, excellent for movies LFE from 18hz to 30hz. However, it does not sound too good with music. I suspect, and please correct me if I'm wrong, it may be because it is front ported. Maybe the driver is too big, or too "slow", for 30hz to 50hz stuff. Just for fun, I connected my small Paradigm PDR-8 (normally used in my office room), back ported, and it sounds a lot better for music. I feel that the fact it is back-ported makes if more coherent with the Horns, but it could be the driver size, I don't know. Now... would the FFRSMark 4:20i sound better? For sure I trust Ed's sound mastermind, but any kind of support like "a sealed sub is absolutely needed for music", would be appreciated. I suspect, and please correct me if I'm wrong, it may be because it is front ported. Maybe the driver is too big, or too "slow", for 30hz to 50hz stuff. 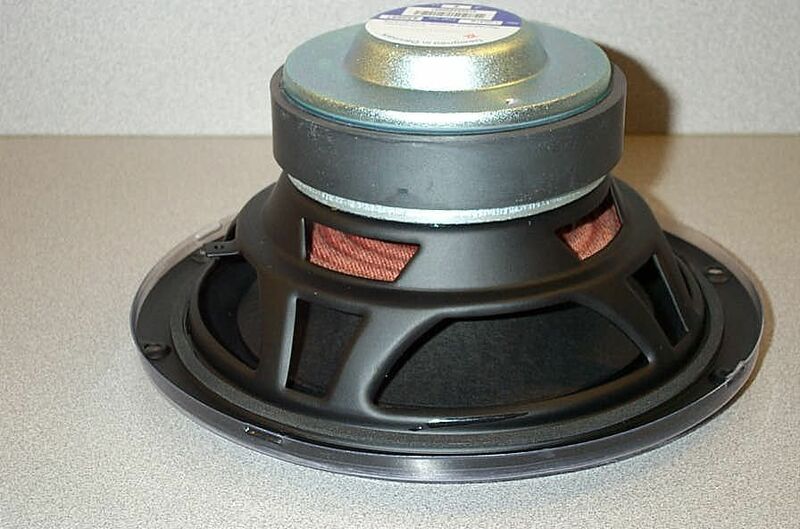 There can be problems with too small of a subwoofer driver. What you have won't cause a problem with being too big or too slow. Magidrakee, the larger the driver the less excursion and in theory less distortion. Smaller drivers require more excursion for a given output and low freq. The problem is that there are many more factors that determine what is "best". Placement is critical but that is why I always use an outboard amp. It allows you to have just a single wire to the sub and that allows you to put it where it should be not where there is power and it's convenient. As to "fast and slow".....well, if one thinks a large high mass driver using a giant motor to overcome the high mass is a good idea it doesn't bother me at all. I've found that smaller drivers with moderate excursion are "better" for most people. I've built TL subs the size of a refrigerator and they were awesome. They also were "real subwoofers" and had little output above 80hz or so. They were seldom heard but often felt. not practical at all. Most subs are used as "bass augmenters" and have output as high as a couple hundred hertz sometimes. The FFRSMark 4:20 i. seems to be more of a "real sub". The xover in my room is at 40-50hz. It is seemless. Near the end of "Sunshine of your love" there is a bass thump, not sure what it is but I bet most have never heard it. With flat response down to 30 you will both feel and hear it. Without a sub you will not with The Horns alone. It is just not there. While that may sound "bad", it's not really, they err on the side of omission. It was not there with my La Scalas without a sub either. It's there with the FFRS Mark 4:20 i. Henry heard it, I felt it. My LF hearing is not near as good as my HF, I've always felt it as much as "heard it". 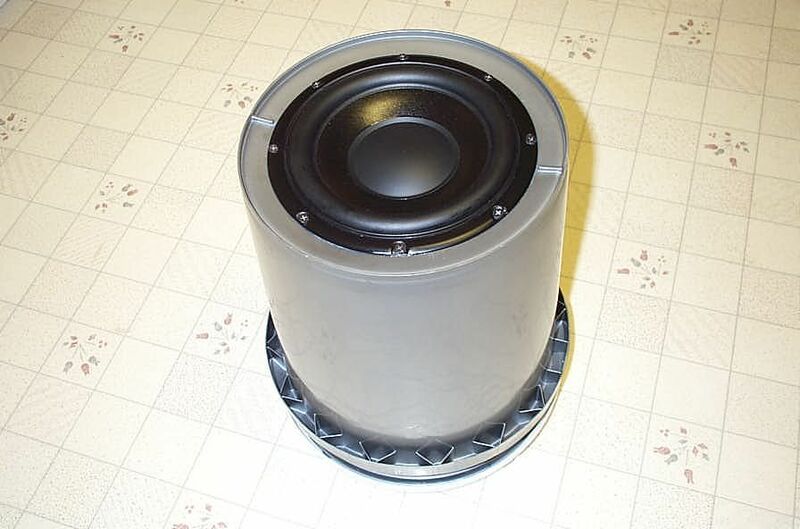 I've never heard a ported speaker I could live with, including subs. This redneck, crazy idea is way better than it should be. Having 2 will lower distortion by reducing excursion needed for same output. Sonic: thanks for the link. It definitely deserves a bookmark. I already did the crawling stuff, but my sub is so big, and the front corners are taken by the horns, so it does not leave many options. I'm also still working on upper-corner bass traps. I think it will help a lot (big dip @ 50hz in my room according to the SPL meter). BTW, I love your new signature. You make me very curious about the FFRS, and I never had a sealed sub, so I'm going to begin the hunt for parts here in Canada. I spent some time listening to the FFRS. At first I was a bit put off by the bass because it sounded "live". That isn't much of a criticism, proved ridiculous on the synthetic bass albums. The best part is that the FFRS does nothing to the other frequencies. If it doesn't affect the vocals, and it's cheap, why not two? or four? Overkill is fun when it's cheap and doesn't have a downside . edit...Mac, I changed "proven" to "proved". I think that is what you meant. I ordered me one of them "whoopers" today. I couldn't stand it and had to have one. No amp yet... I'm still thinking about that. Once I hear it in my house I'll do something. Now I'm searching high and low for the perfect pickle bucket (no sheetrock-mud or paint bucket for this guy). I guess it's the cigarette that makes me smile the most. Gotta love those hillbillies. I'd hate to piss him off. Alright guys, here's my FFRS effort. I have pictures because I like pictures. 1) I cut the woofer hole using a small jigsaw with a fine wood blade and it was really fast and easy, and left a clean cut. I used the clear protective driver cover as a template for the circle by cutting it to size with scissors (you'll see what I mean if you get one). 2) I decided to use some old binding posts for connection terminals and drilled the holes for them. I think Ed just ran a length of wire through a sealed hole, but I had these and wanted to be stupid. 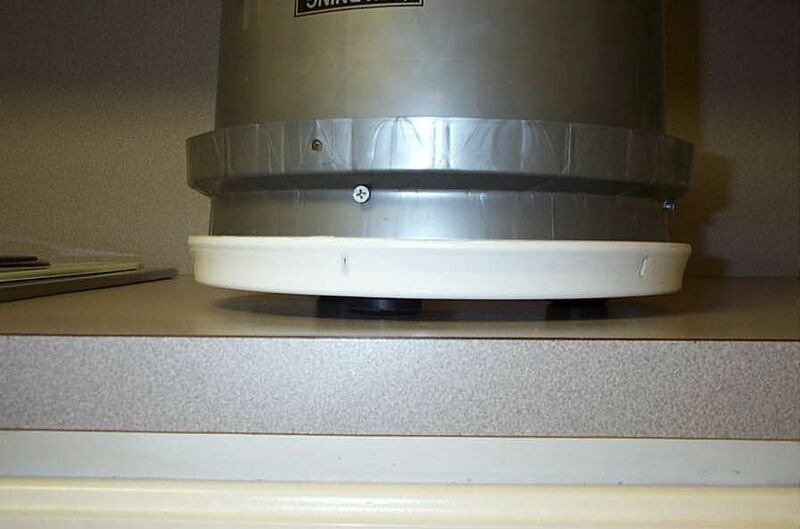 3) I drilled three holes in the lid at 120 degrees spacing to attach three big rubber feet I had from another time long ago. 4) I pounded the lid onto the bucket with a rubber mallet and applied the silicone bead previously mentioned on the inside bucket/lid seam to ensure nothing would ever leak (overkill). 5) I drilled holes for and installed four 3" deck screws into the bucket sides just below the big reinforcement ring to anchor the quikrete. 6) I attached the feet through the previusly drilled lid holes. 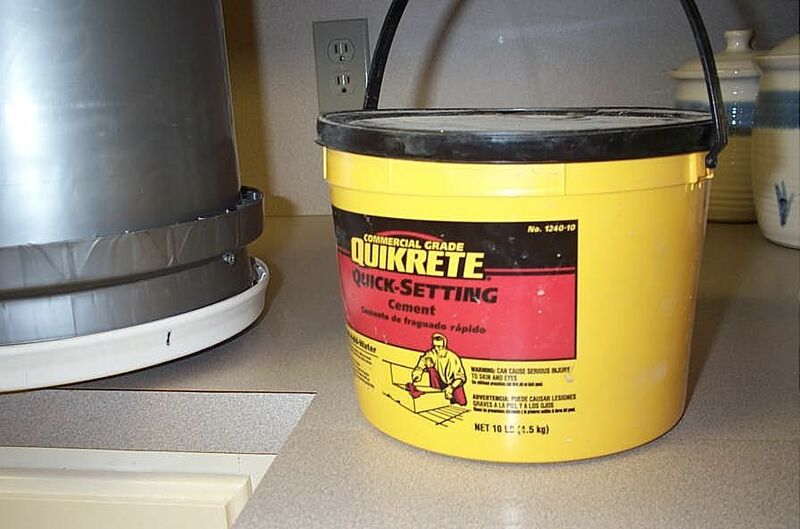 7) I mixed and carefully added the quikrete through the driver hole and spread it in the bottom with my best big serving spoon used as a trowel. I let that cure for a day and installed the binding posts in their previously drill holes. 10) I used some good ol' Woods extension cord for cabling from the binding posts and soldered those in and connected the driver. 11) I used silicone and screws to fasten the driver to the bucket. 12) I admire my FFRS while the glue cures. Jeez... it looks like good old google drive is screwing me. I had trouble getting those photos linked (there was intermittent trouble getting the "copy url" function). Now they've evidently moved or something. I'll just move them to another host and try to repair it. Hopefully the photos are there to see now. I had a chance to listen to the FFRS and it's really good, no kidding. It behaved much better than I expected since it was brand new. Of course, I wasn't making it rattle with big time volume, but I did have it reaching for some impressive lows. Compared to my twin TBI Magellan VI subs, it clearly was more efficient and made its presence known more than they did. The TBI's virtue is they aren't noticeable and their quickness assists in them being easy to integrate at about any crossover point. I haven't tried to throttle the FFRS back to the TBI levels to see how it disappeared. To be honest, I was having too much fun with an old P-funk cd. Bootsy Collins is a monster bassist. And some Mother's Finest thrown in for good measure (gotta love a drummer christened "BB Queen" ). It's a house rocker and brings out the "stupid" in me. I like it a lot now and I know it'll get better. I can see another coming soon, it's so cheap and good, why not? I was driving the TBI's and the FFRS with an evil class D amp (sorry Ed)... a Crown xls 2500. It really makes any sub hooked to it sound well controlled and go deep. It's noticeably better than the 200 watt TBI sub amp I have, it does stereo and it makes crazy power for not all that much money and weight. Looks great, Henry. Could you explain how you connected it to the Crown amp? Does the Crown have speaker level inputs? Thanks.